If you are like most techie travelers I know, you are beginning to get lost in a maze of chargers, cords and cables. Until all our devices are charged by osmosis, we need a way to manage the clutter and danger of too many cords sitting on our desk or nightstand. 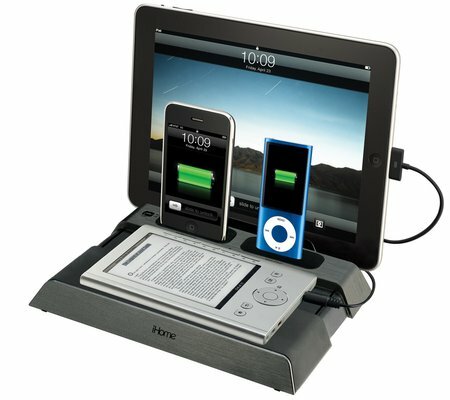 Enter iHome,with their simple but efficient answer for at least part of your wire and charger dilemma. The iB969G charging station will take care of the four most popular devices probably cluttering up your life. With only one visible cord, you’ve got a place to store and use your iPod, iPhone, iPad, and Blackberry or Sony e-Book reader. Oh, and did I mention it all looks neat in the process? It does.